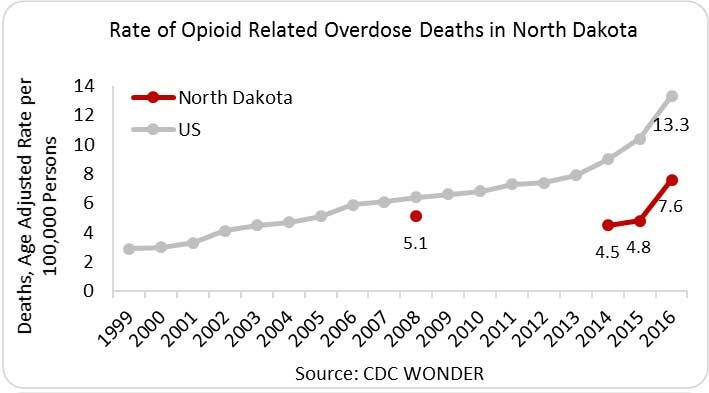 In 2016, there were 54 drug overdose deaths in North Dakota―a rate of 7.6 deaths per 100,000 persons. 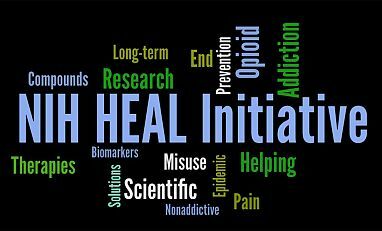 While the opioid-related overdose death rate is less than half the national rate of 13.3 deaths per 100,000, the sudden rise from 4.5 in 2014 is concerning. 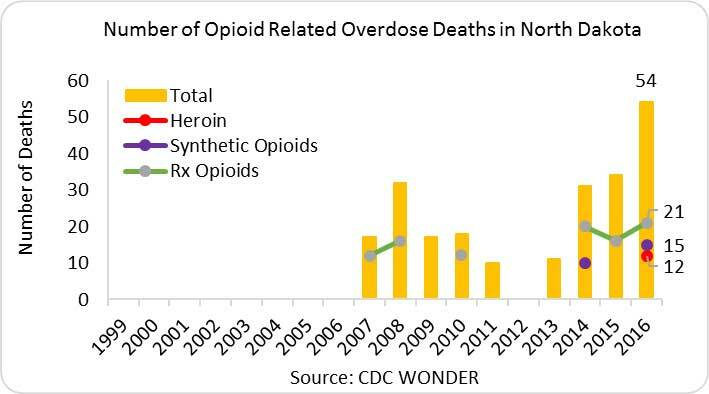 Overdose death data for heroin and synthetic opioid-related deaths, reported by the states medical examiners to the CDC, have been too low to estimate a reliable rate; however, in 2016, the number of deaths reported were 12 and 15, respectively. In 2015, North Dakota providers wrote 60 opioid prescriptions per 100 persons (approximately 466,000 prescriptions)—less than the average national rate of 70 opioid prescriptions per 100 persons (IMS Health, 2016). A CDC analysis of NAS analysis across 28 states estimated a national NAS average of 6.0 per 1,000 births in 2013 (CDC, MMWR, 2014). The North Dakota Department of Human Services estimated 120 babies born with NAS in fiscal year 2013 among Medicaid recipients—the rate is unavailable. State Incidence: Of the new HIV cases in 2015, 22 occurred in North Dakota, with 10.0 percent1 of new cases in males attributed to IDU and 0.0 percent of new cases in females attributed to IDU (AIDSVu). State Prevalence: In 2014, an estimated 306 persons were living with a diagnosed HIV infection in North Dakota—a rate of 50 infections per 100,000 persons. Of these, 17.0 percent1 of males and 9.2 percent of females were living with HIV attributed to IDU (AIDSVu). State Incidence: In 2015, North Dakota reported 1,063 cases of chronic HCV and 0 cases of acute HCV (NHhealth.gov). State Prevalence: Current state prevalence data are not available. As of 2010, an estimated 4,400 persons (830 per 100,000) were living with HCV in North Dakota (HepVu).